My kids are wearing the costumes. I got a pattern from the store for a basic jumpsuit. I got red fleece material for thing 1 and 2. I got black fleece material for the cat in the hat. I took red and white felt for the cats hat and cut strips out and sewed them together. For thing 1 and thing 2 wigs i took a beanie cap and glued cotton balls all over it. I then pulled them out to give them a pointed look. 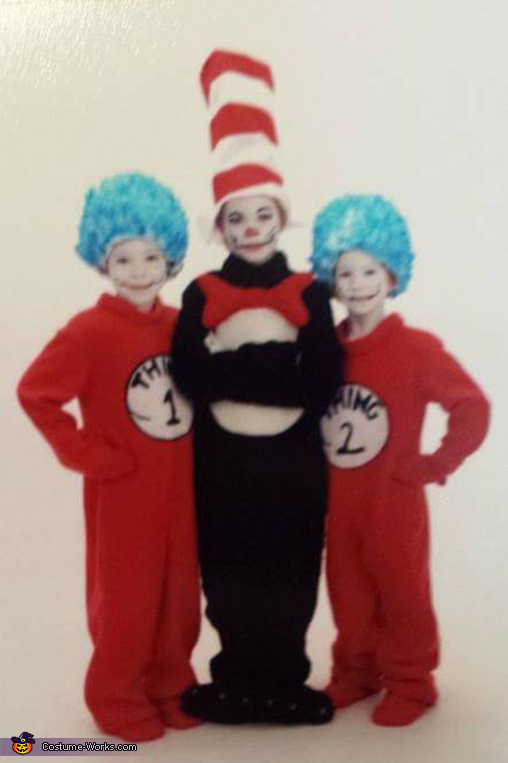 I then sprayed them with blue hair dye i drew there thing 1 and thing 2 signs by hand and cut them out of white felt. It cost about $60 to make all 3. I used a lot of coupons which made my materials cost cheap.